Day started with the Floral Tribute to Late sh. Jagannath Gupta ji and saraswati vandana. 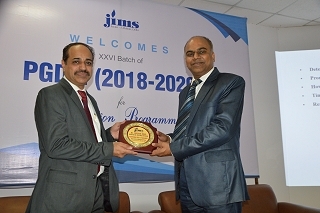 Thereafter the gathering was addressed by Dr Pratima Daipuria (DeanPGDM), She told students about the rules and regulations and curriculum to be followed, then a speech was given by Dr. Pawan Gupta, Director, JIMS who told students about the college, shared certain stories and achievements about JIMS. 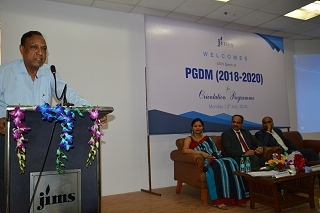 Orientation program was also addressed by the Chief Guest of the day Mr. Deepak Bhel (Director – Human Resource, The Park , New Delhi) who motivated students for the new beginning of the course and shared his experiences of life about the success achieved by him in his life and also about how to tackle the failures in the life. Program came to an end with a vote of thanks and National Anthem and then Students were directed to their classrooms for the workshop on“Team work makes the dream work”.